by Tom Williams, M.A., CPESC and Josephine Joosten, M.L.A. Mine site reclamation practices, particularly revegetation and soil mitigation techniques, can provide invaluable information when applied to commercial and residential landscape projects. 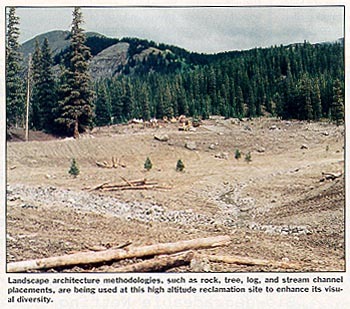 Reclamation projects typically require establishment of stable, functional ecosystems. This demands an in-depth understanding of plant communities and how they interact with the physical environ-ment over the long-term. In the urban landscape, incorporating reclamation principles produces a site that requires less effort and expense to maintain by establishing a balanced climax or sub-climax condition that remains stable over time. Professionals at Golder Associates Inc., an international mining and environmental en-gineering firm, have applied reclamation techniques to create numerous highly successful, sustainable and aesthetically pleasing landscapes. In nature, when an ecosystem is disturbed by natural catastrophe, the area gradually revegetates through a series of transitional stages, known as seral stages, to an ultimate, or climax vegetation type. Seral stages follow a characteristic progression that includes: grasses forbes shrubs evergreen trees deciduous trees. Reclamation projects typically attempt to re-establish a pre-existing or pre-determined climax ecosystem. However, due to the large scale involved, it is usually too expensive to establish a seral stage much beyond the forb or shrub stage. In urban landscapes, the project scale is typically small enough to afford the cost of directly planting a climax-type community. However, all the environmental conditions must be properly addressed. Otherwise the landscape will deteriorate back to a seral stage where the conditions are adequate to support it, and then begin a natural transition back to a climax community. By providing a site-specific combination of plant species and environmental conditions, (i.e., aspect, protection from prevailing winds - exposure, soil conditions, water, and nutrient levels) a miniature climax-type ecosystem can be created which will require minimal input to remain stable or sustainable. The use of native plant materials to save on water and maintenance costs has been popular in many areas across the U.S. since the early 1980s. 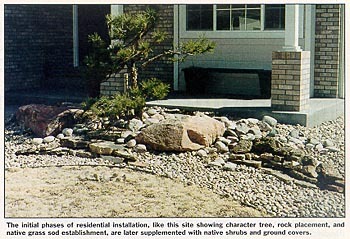 Landscape design that emphasizes the use of mulches, rock groupings, groundcovers, and native plant materials is typically referred to as xeriscape. However, many of these installations are poorly executed and demonstrate a lack of understanding about the complexity of ecological concepts. Using a holistic ecological approach to create a sustainable landscape in a commercial or residential setting is a relatively new and undeveloped approach. But today, developers, communities, and home owners are becoming more sensitive to the need for, and the value of, sustainable landscapes in the urban environment, and the demand is on the rise. Typically, the process we have developed for commercial and resid-ential landscapes from our mine reclamation experience begins with identifying the aspects and exposures which will exist when construction of buildings, roads, bridges, fences, and other sheltering features are complete. We then compare these aspects and exposures to native plant communities under similar conditions. A species list is developed for each zone, consisting of native and adapted plants. A literature review for the selected species is conducted in order to identify the soil types and conditions best suited for these plants. Over the years, we have developed a large database of native species and their requirements, which allows us to accomplish these steps in a comparatively short period of time. Following plant specifi-cation, the soils from each of the various planting zones are sampled and analyzed. Urban land development projects are not required to salvage topsoil, as most mining projects are but, whenever possible, this reclamation practice is strongly encouraged. When the existing topsoil is lost in the construction process, it is still preferable to use the subsoil material present in the interest of sustainable practices. Through our experience with revegetating difficult and often toxic soils at mine sites, we have developed many specific and cost-effective methodologies for amending even the most difficult soils. Water and nutrient requirements are generally lower for native plants than for exotic species, and over-amended soils can often inhibit the growth of native plants and give a competitive advantage to introduced species. Once the soils have been properly amended for the native species selected for the site, the creative (and more fun) aspects of the project may begin. A site will typically have a variety of aspects and exposures created by the buildings, other structures, and the surrounding gradients. By mapping all the different micro-environments, a continuum of plant species is created which transitions from one plant community to the next. For example, a south- or west-facing slope exposed to direct sun will be planted with a drought-resistant plant association, which transitions subtly into a more mesic plant adaptation on the eastern exposures, and continues into a cooler zone with freeze-hardy species on the north. Locally available mulching materials, such as peagravel or river rock, and chipped and shredded local treefall, are used to the maximum extent possible. Placing rock groupings throughout the planting creates a more natural appearance and provides additional micro-environments for the less-common, more particular species of a plant community. Native grass and groundcover sods are used for quick establishment to prevent soil erosion in the early development of the landscape. This ecological approach is adaptable to almost any project from residential and commercial installations to greenbelt and highway applications. Our largest projects have included golf courses and mountain developments, and many of the designs are inspired by wilderness areas, windswept peaks, or shady canyons. Sensitive site design and placement of plants and materials, combined with the accurate representation of native species and ecological conditions, are the keys to our holistic approach for re-creating these beautiful and distinctive landscapes found in nature. The true value of this approach is that it can be used as a concept for large scale developments and whole cities, as well as residential sites, saving large sums of money over the years, while retaining the original beauty and ecological value. For more information, contact Kristin Thomas, Golder Associates Inc., 3730 Chamblee Tucker Road, Atlanta, GA 30341, (770)496-1893, fax (770)934-9560.